The sixth archaeological campaign of the “Tyritake” Polish Archaeological Mission of the National Museum in Warsaw took place between 16 July and 26 August 2013. Excavation works lasted between 21 July and 24 August. They were carried out by 52 persons: 28 from the Ukrainian side, 10 from the Russian side and 14 from the Polish side. During the field season, apart from continued exploration of sectors 3–13, 15, and 17–19, five new archaeological sectors (5 × 5 m) were delineated, and digging began in four of them. In total, trench (excavation unit) 27, where the Polish mission operates, covers the area of 675 m2. 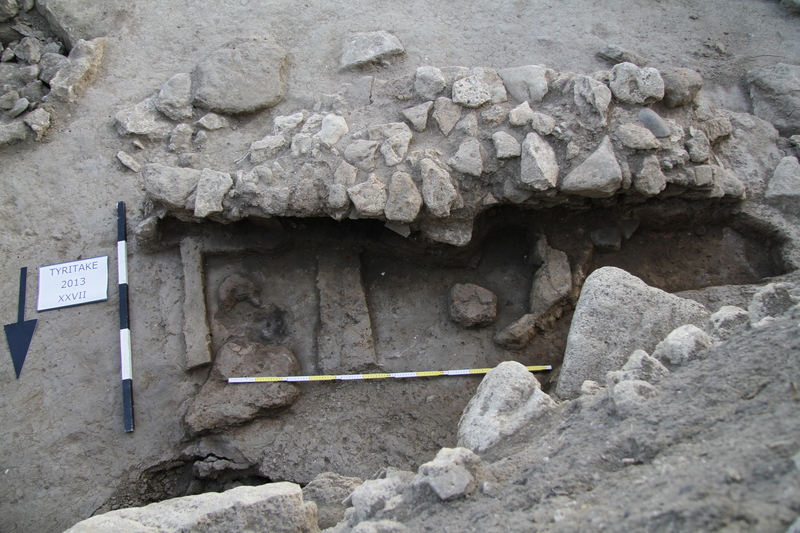 Continued exploration of the remains of buildings from the Roman and Early Byzantine period was carried out in sectors 10–13. In the course of the work, archaeologists unearthed the structures of an unidentified architectural complex (no. VI) from the Roman and Byzantine period. This appears to have been a residential building, destroyed in a fire possibly caused by one of the invasions that took place in the fifth and sixth centuries. This is suggested by a burnt layer, most likely the remains of the wooden ceiling of the first floor of this building. 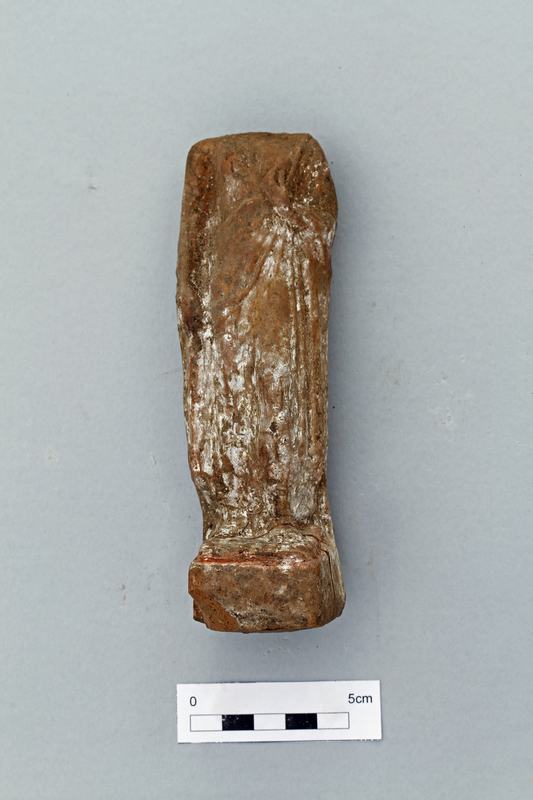 A number of finds from this location suggest that it could have been the female part of the house (e.g., loom weights); other finds include iron nails and clout nails that were originally used to build the wooden ceiling. 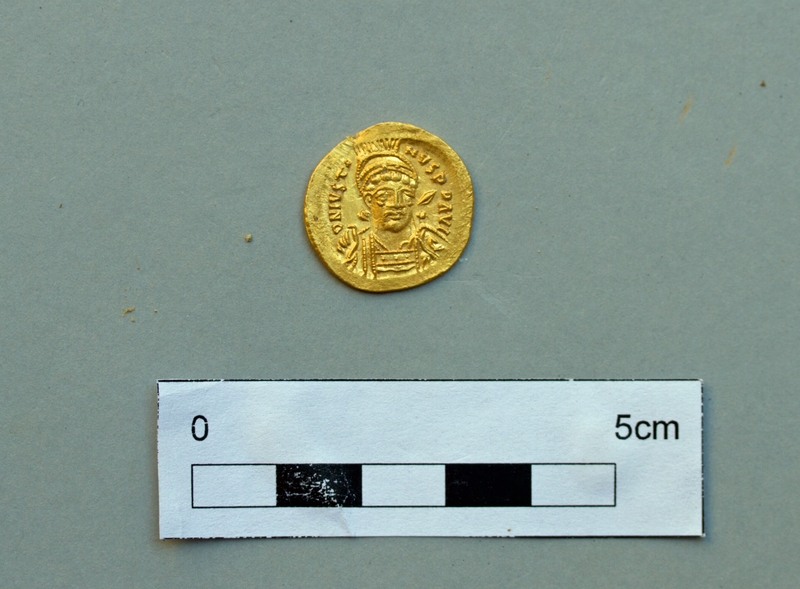 The most important find of the season, a golden coin dated to the end of Justin I’s rule (he ruled between 518 and 527 AD), was found in the vicinity of the complex (sectors 10–13). Preliminary analysis indicates that it is a solidus coined in the ninth office of Constantinople between 522 and 527 AD. Three storage pits were uncovered near the complex of buildings and thoroughly explored. Further work in this area in subsequent seasons will allow us to formulate more precise hypotheses about the purpose of this building. The coin represents an important indication about Tyritake’s wealth in the Byantine period. It confirms earlier assumptions that the town belonged to the very few prosperous centres of Cimmerian Bosporus at the time. 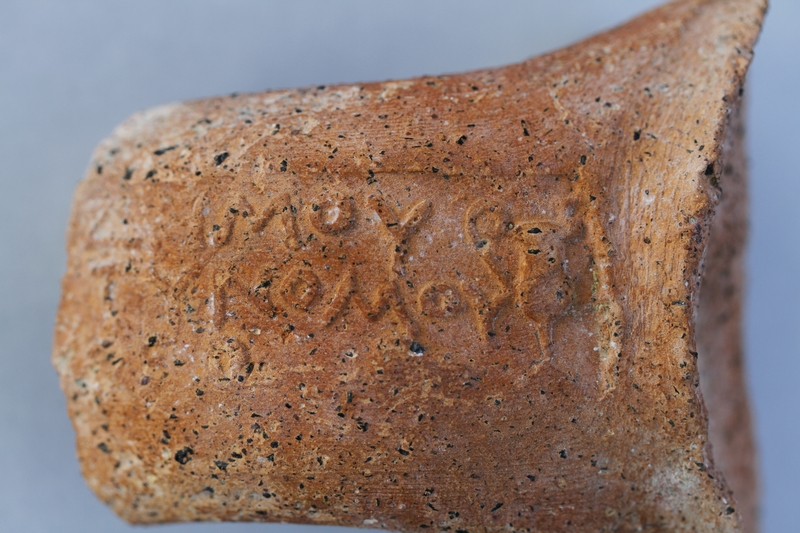 It also backs the thesis put forward based on the Greek inscription found in the last field season, that Tyritake was the bishop’s seat between fifth and sixth century. However, the possibilities for further exploration of the area are limited due to the fortifications of a Romanian unit stationed here in 1943, which were partially built based on the antique ruins. A sizable area adjacent to the above-mentioned complex of buildings, encompassing parts of sectors 10–11 and 16–18 as well as almost entire sectors 17 and 15, is occupied by a bunker erected during World War II. Its entrance, located in the vicinity of the aforementioned complex, was revealed by the Polish expedition during the 2013 field season. Earlier cultural layers were destroyed in the whole area of the bunker. The complex discovered in the previous field season in sectors 4–5 and 17–18, whose purpose remains unknown, was cleaned. In 2012, archaeologists unearthed pit 19 here, where they found skeletons of four horses, bird bones and well-preserved black-glazed sacrificial vessels from Attica dated to the fifth century BC. 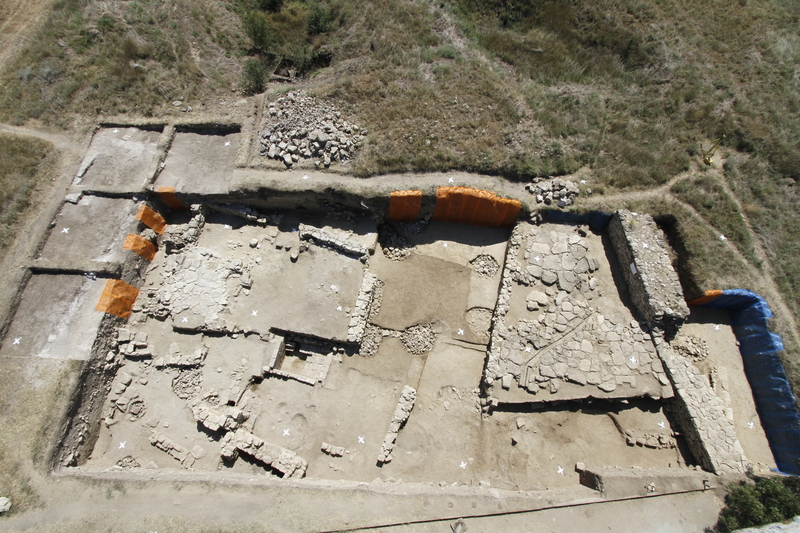 These finds, as well as the character of the structure (sector surrounded with dried brick walls), suggest that it could have been a part of a temenos that may have formed part of a complex of temples. Results of the work carried out in adjacent sectors 9, 3 and 6 offer some confirmation for this hypothesis. They were enough to challenge the theory proposed by Prof. Gaydukevich, who conducted excavations here in the late 1930s, according to which the walls he unearthed constituted the so-called house A. Owing to its structure, unusual for Cimmerian Bosporus, it was listed in all textbooks on Archaic archaeology of this area. However, in light of this year’s excavations, we may state that this house never existed in the form presented by Prof. Gaydukevich. What it in fact represents are several construction stages, most likely of different buildings, one of which – dated to the fifth century BC – may have been a small temple. This last hypothesis requires further verification in the following field seasons, including further exploration of sectors 7–8 and 1–2, adjacent both to the aforementioned building and to the supposed temenos. Only after this area is fully examined, which is scheduled for the 2014 field season, will we be able to establish the original purpose of this part of the town in the Archaic period. What also deserves a mention here is that the Polish expedition identified the first Classical layer in Tyritake, very rarely found in other towns in the region. The walls of structures from this period were made from dried brick, which is extremely difficult to distinguish in the course of excavation work. 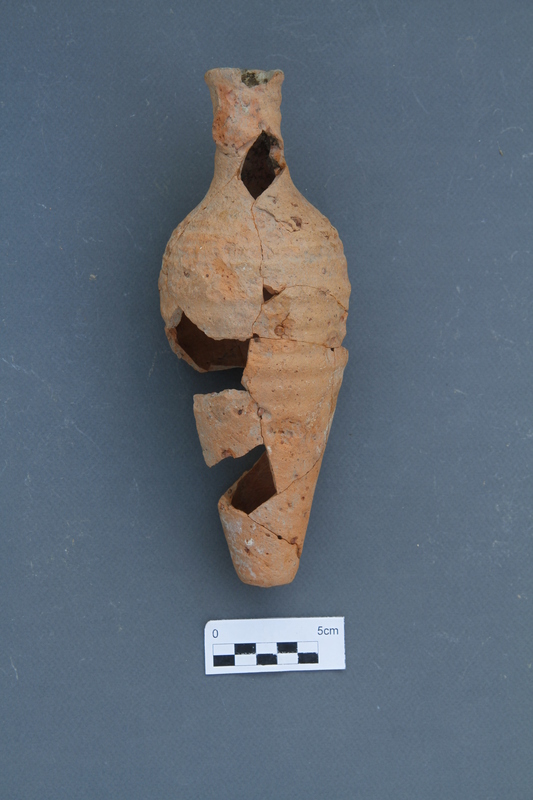 The start of exploration in newly established sectors 25–28 is aimed at unearthing parts of the Late Roman kitchen discovered in the previous field seasons, which remain beyond the trench. The particularly good condition of the kitchen and part of its equipment as well as the unique character of the find caused the Polish-Ukrainian management of the project to decide that once the kitchen is fully revealed, it will be restored. Work on this endeavour will probably last several field seasons. The entire campaign yielded 152 discrete artefacts, including more than 10 bronze coins from various periods, one gold coin, a number of fragments of various ceramic objects, terracotta lamps and objects, spindle whorls, architectural elements and small metal objects. Among the most interesting are such rare finds as a fragment of a solar clock and a lead stopper for a vessel. What should also be mentioned here is the work of Polish conservators who participate in our expedition based on an agreement between the NMW and the Warsaw University of Technology. The conservation mission continued work on securing the trench for the winter and restoring the fragments of ancient architecture unearthed by archaeologists. The conservators managed to secure, using a hydrophobic preparation, a defensive wall from the sixth century which they had partially reconstructed during the previous field season, as well as the most valuable walls of Archaic structures unearthed this year. They also began a research programme for the next couple of years, aimed at establishing the composition of the mortar used to build the ancient walls, to which end they collected a number of samples they will work on in Warsaw. The results of this research should make it possible to restore a part of the structure using a technology that is as similar to the original one as possible. At the same time, this meets the requirements of the Ukrainian side, which sees the mission’s objective as both archaeological exploration and creating an archaeological park in Tyritake. It should also be stated here that work of the NMW mission is received with considerable interest by the Crimean population, as testified by the frequent visits of representatives of local media and active support of the Ministries of Foreign Affairs of Poland and Ukraine.